The Straight Fabric Stand Popup Stand - Double Sided features full color custom printing facility to insert your brand details to Promote your Brand. FREE --- SET-UP & SHIPPING included on all orders for this item! Price includes one sided full bleed printing! Ensure that your brand impression never goes unnoticed with our Straight Fabric Stand Popup Stand – Double Sided! Ideal for those locations where stands will be viewed from any direction, this fabric popup stand features two sided stretch fabric with customization ability to insert any custom text or graphic. High quality elastic knitted material covers the aluminum stand. 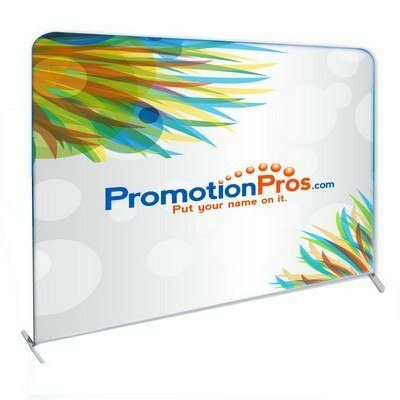 Choose from three sizes and use our full color printing to include logo, picture, text or artwork to be displayed on the fabric.